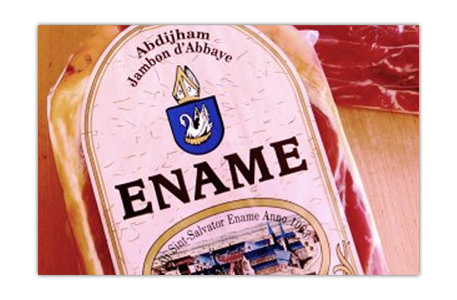 Discover the flavor of Ename Abbey Ham. 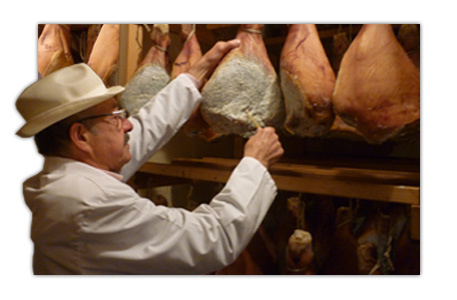 In Italy everybody is very proud of their Prosciutto di Parma, Spaniards boast of pata negra. But in Belgium, we also have a long tradition of cured hams. In the beautiful Flemish Ardennes you can find Van Hoe Products nv, the producer of the cured Ename Abbey Ham, a very light-salted and long-term cured top quality ham. The first issue of concern is the choice of a healthy ingredient: pigs which are exclusively bred on a vegetable diet, exactly the way it was done as early as many ages ago. The carefully selected gammons are rubbed with coarse sea-salt and put next to each other. No flavouring and colouring matter are added. The gravy is conserved, so that none of the fine taste and subtle aroma gets lost. After the dry-salting process, the gammons are matured for a long period. The combination of temperature, ventilation and humidity is of great importance. The perfect bacteriological balance in these drying rooms is only to be obtained after years. That is how natural yeasts can start a slowly enzymatically process. In the meantime the hams are provided with a layer of lard in order to prevent crusting. This lard layer is removed afterwards. 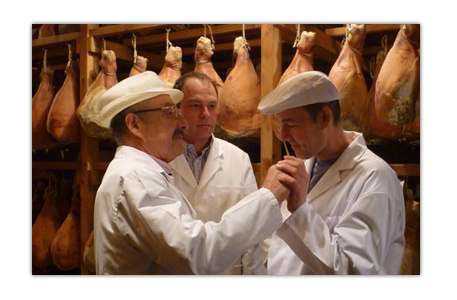 During the maturation period the Quality Manager stabs the ham with a bone. Thàt particular bone is very porous so it takes and holds all flavours of the ham. When he pulls out the pointy bone and holds it under his nose, he can smell on the flavor the state of the ham’s maturation. After a maturing period of at least nine to twelve months, depending on the weight, the hams are rinsed. The hams are also dry-salted and dried on the bone, which is quite favourable for the taste. They are only boned afterwards and then sewn up and shaped. The final quality inspection is performed just before they are vacuum-sealed and labelled. or in between dinners on a slice of bread!